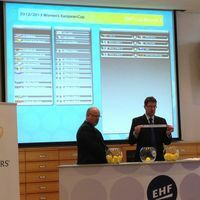 On Tuesday 24 July 2012 five competitions were drawn in the EHF headquarters, Vienna (AUT). The first two rounds of the Women's EHF Cup are now known. On Tuesday 24 July 2012 five competitions were drawn in the EHF headquarters, Vienna (AUT). The draw decided the fixtures that form the first two rounds played in all five competitions. The draw of the 2012/13 Women's EHF Cup was the fourth draw of the five to take place and was carried out by Gustav Bienerth. The first leg matches will be played on 13/14 October 2012, the second leg matches one week later on 20/21 October 2012. Winner R2 KGHM Metraco Zaglebie Lubin/RK Zelina vs. BNTU-BelAZ Minsk Reg. The first leg matches will be played on 10/11 November 2012, the second leg matches one week later on 17/18 November 2012. The 16 winners proceed to the next stage, the round of the Last 16. The fixtures will be drawn on Tuesday 20 November 2012. Find more information on the 2012/13 Women's EHF Cup here. Click here to return to the overview of all five 2012/13 European Cup draws.